Congratulations. You just ran a half-marathon. In January. In New York City. And in terrible weather conditions. For that accomplishment, you deserve something special...like a medal! But have you ever thought about what goes into a medal? How it goes from the conception phase to hanging around your neck at the end of a race? Hopefully you’ve changed into some warm, dry clothes following this morning’s race in the rain. 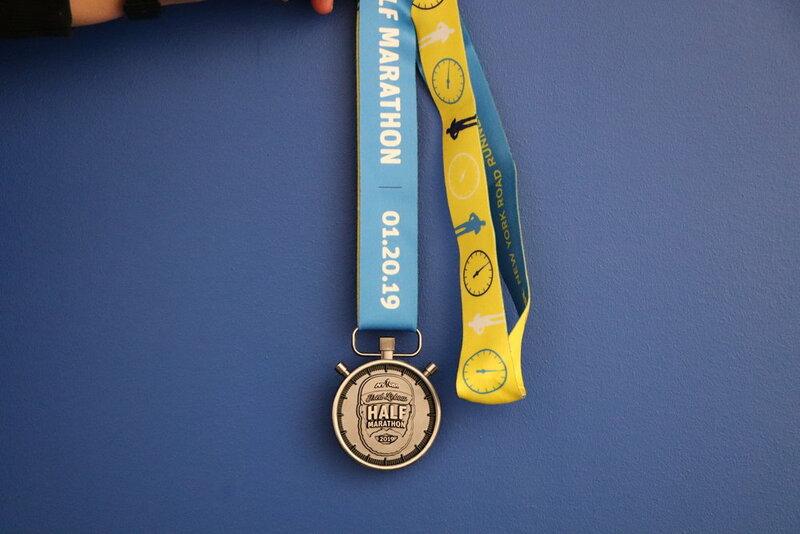 And if possible, we recommend you grab a cup of something warm, settle in, and learn more about how the 2019 Fred Lebow Half-Marathon medal came to be. The brainchild of NYRR’s Creative Services team, which falls within the organization’s Brand Marketing and Communications division, the medal’s design was extremely popular among runners this year. “The Fred Lebow Half-Marathon is one of our races where we try to celebrate the history of the people who have had a lasting impact on NYRR and their contributions to the running community,” she said. For those who are unaware, Lebow co-founded the New York City Marathon in 1970. He became president of NYRR in 1972 and served in that role and as race director of the New York City Marathon for 22 years, until his untimely death from brain cancer in 1994. Oh—and while running through Central Park, you may have seen his statue, which is located at Engineers’ Gate on the east side of the park. Back in 2016, NYRR introduced a medal for the race—an added treat for those running 13.1 miles in tough January conditions. 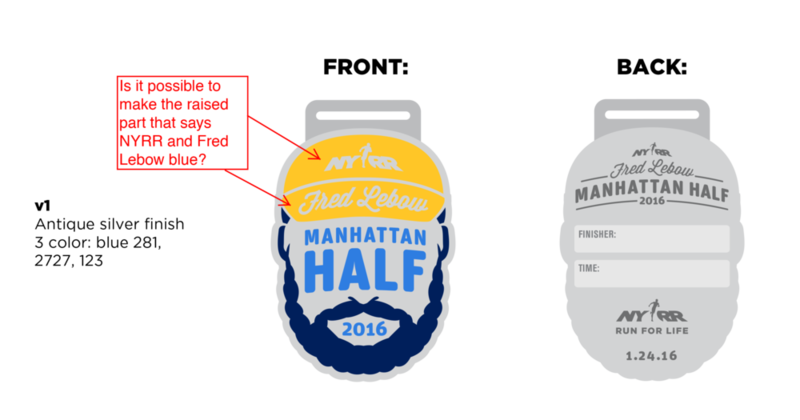 After settling on using Fred’s iconic image as the design for the piece of bling, a snowstorm led to the cancellation of the race and runners never got to earn their “Fred head” medal. As a result, the medal design was replicated in 2017. It was then tweaked somewhat in 2018. For this year’s race, the team experimented with different styles, including different shapes and cutouts, before landing on the stopwatch design. Why a stopwatch, you ask? Well, as race director of the New York City Marathon, Lebow kept more than a watchful eye on time (see his statue at Engineers’ Gate). But it’s one thing to have an amazing idea and design. The hard part is making it functional. Another obstacle in medal design is that they need to have an area on the back for engraving purposes. That piece of real estate also needs to accommodate long names. The result was a hit—with the medal preview garnering more than 16,000 views on Instagram in the weeks leading up to the race. And for the 3,725 finishers at the Fred Lebow Half-Marathon, the response was overwhelmingly positive. The next race where runners can earn a medal is the United Airlines NYC Half. And our next available race that you can sign up for is the NYRR Al Gordon Brooklyn 4M. 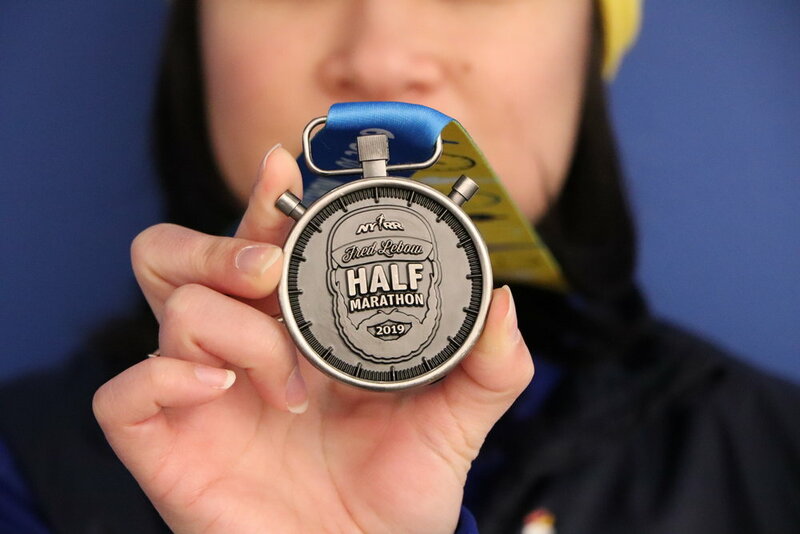 Sunday, January 20: 10:00 a.m.–3:00 p.m.
Monday, January 21: 12:00 p.m.–7:00 p.m.
*Please note that we are only able to offer engraving for participants in the 2019 NYRR Fred Lebow Half-Marathon. Please have your NYRR member number (available on your NYRR member card or in My NYRR) or download the NB App and show your Gold status at time of engraving. Can’t make it? Send a proxy to have your medal engraved; they’ll just need your NYRR member number. Finishers who are not NYRR members can purchase an NYRR membership through their My NYRR account, and will be able to have their medal engraved after becoming an NYRR member. Visit our NYRR membership page for more details on NYRR membership levels and prices. Alternatively, runners can learn how to become a myNB Rewards Gold Member to receive free medal engraving.